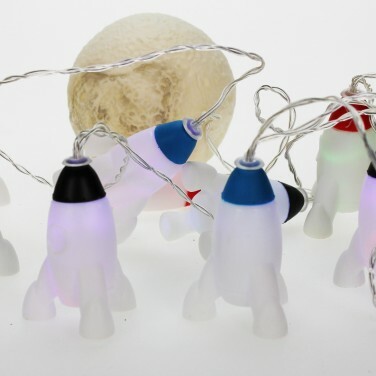 Blast off to cosy bedtimes with magical colour change rocket string lights featuring a shining white moon! 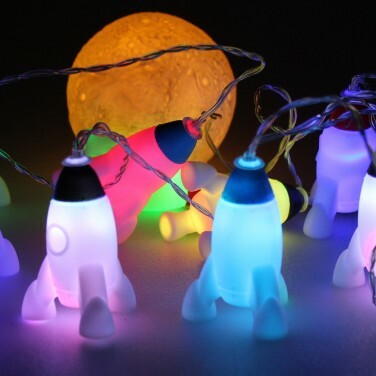 Space mad kids will love these soft and squidgy rocket lights that shine with a mesmerising colour change glow! 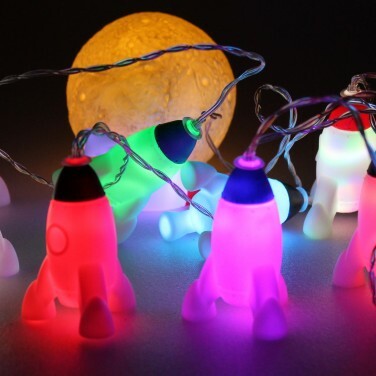 Nine soft rockets are lit with colour change LEDs, whilst a larger moon is lit with a white LED to make a magical string light set with a funky cosmic theme. Battery operated, these colourful little rockets help to make a cosy space for bedtime, offering the extra reassurance of soft light at night whilst the soothing colour change effect relaxes busy minds. A super soft space rocket cushion with light up stars for extra cosmic effects!